What if everything we ‘know’ about marketing is wrong? Joe Pulizzi and Robert Rose raise fundamental questions about marketing in their new book, Killing Marketing, which will come out in September. Marketing leaders will find big new ideas to consider in this powerful work of thought leadership. 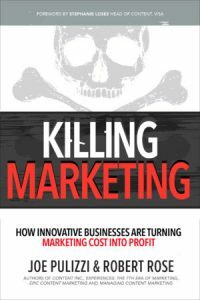 Killing Marketing says: Make marketing a profit center rather than a cost center. Create content to attract an audience in your defined niche. Joe Pulizzi fathered the content marketing movement. Pulizzi and Rose point to signs that marketing is slowly killing itself. Making incremental changes at a time that demands disruption, when marketing needs to transform itself into a business’ strategic growth driver. Interrupting customers with advertising that causes friction instead of giving buyers what they need to succeed: friction-free answers, insights, entertainment and community. Separating marketing into media channel siloes that must compete for budget, support and attention, rather than focusing on the big job of capturing an audience and creating targeted content that’s so good it can be sold at a profit. Create more loyal customers (Retention goal or keeping customers). Now companies can transform marketing from a cost into a profit center. Robert Rose offers wise and practical advice. Companies can make money with content by becoming publishers who take a professional approach. Companies like Red Bull, Lego and Arrow Electronics are already generating profits from content business units. They’re lighting a path that shows how to generate profits with powerful content that attracts new followers and subscribers. Go way beyond describing value: create value with content. What if your content not only educated buyers, but also generated a profit? Build audiences of buyers or acquire media properties that already have an established audience. Listen to gain unique insights from buyers’ pain points. Offer buyers content, media and events that address specific interests. Create products and services that their audience wants from them. Stage events that deliver a great experience as you bring buyers face to face. Build a strong community around the topics the audience is interested in. Make content so good that buyers willingly pay for it, as Lifetime Fitness did with its magazine and the Content Marketing Institute did with its conference. Get to know your buyer persona better than anyone else. Publish content regularly to attract subscribers who fit the buyer persona. Listen to learn their needs, then deliver valuable content and experiences to them. Gather data and seek insights into which products and services your audience wants from you. With the right audience, you can even help R&D spawn ideas for new products and services. Address each audience with content about the topics it wants to know. It’s all about what buyers want to consume, not what Sales wants to produce. Keep the focus on buyers, their needs, their pain points and their solutions. Break down artificial boundaries between content and marketing. While most marketers publish content today, most don’t approach content as a separate business. When approached as a separate, profit-making business, content can realize its full potential to win attention, subscribers, buyers, customers, sales and revenue. Many companies take the easy way out – by publishing content that’s safe. They say the same things that everyone else in their industry says, rather than risking a unique opinion or viewpoint. But you can’t “out-obedience” your competitors, as Seth Godin said. Acquire, curate or create content that audiences find valuable. For example, Arrow Electronics bought a number of trade magazines and websites in the electronics space to make itself the content leader for electrical engineers. Content is a separate Arrow profit center that enables the company to reach its buyers at a lower cost than before. “Not only has Arrow purchased amazingly valuable subscriber lists and editorial talent, but it also purchased stand-alone marketing that is profitable unto itself,” Rose writes. Measure what matters: audience, sales and revenue. Generate the minimum amount of content that can achieve maximum results, Rose says. Don’t make a false assumption such as: the more times a customer touches your content, the likelier they are to buy. Instead, build a friction-free flow of content to turn readers into subscribers, and subscribers into customers over time. More and more companies will succeed in marketing by not only describing value, but also by creating value with profitable content. That’s a lesson demonstrated by the Michelin Guide more than a century ago. Killing Marketing shows how companies can learn to transform content marketing from a cost center to a profit center. In so doing, the book defines a new future full of potential for content and marketing. I look forward to getting my hands on a copy of the book soon, at Content Marketing World in Cleveland. I hope to see you there! Who Matters Most to Your B2B Content Marketing?